Watch highlights above, featuring portions of the Philharmonic’s performance of Bernstein’s Candide Overture and interviews with service professionals attending the event. And read the New York Times review. Join us; all are welcome. Three performances remain: tonight at 8:00 p.m., Saturday at 2:00 p.m., and Saturday at 8:00 p.m. Those wanting to attend can check nyphil.org for real-time ticket availability. Additionally, there will be a standby line in the lobby of David Geffen Hall, where tickets will be distributed on a first-come, first-served basis. Last week Yo-Yo Ma joined the New York Philharmonic for a triumphant US Premiere. On Wednesday he traveled to Harvard, his alma mater, for a conversation with Philharmonic President and CEO Deborah Borda — who in 2015 became the first arts executive to join Harvard Kennedy School’s Center for Public Leadership as a Hauser Leader-in-Residence — for a free, public conversation about art, music, and social justice. Interested in music with a social conscience? Join us in May and June. Five-dollar tickets are now on sale for Phil the Hall, April 4–6. New York’s first responders, volunteers, and service professionals are invited to experience the New York Philharmonic, led by Music Director Jaap van Zweden, performing music connected to New York and its Orchestra — by Beethoven, Bernstein, students in the Philharmonic’s Very Young Composers program, and more — live at its Lincoln Center home. Already confirmed to attend are those who work for the FDNY, NYPD, New Women New Yorkers, and Coalition for the Homeless; veterans; teachers; and many more. Nia Franklin, Miss America 2019, will host the concerts. In this new video, Nia explains why classical music is important to her and invites New Yorkers to come hear the New York Philharmonic. Last evening at the Stanley H. Kaplan Penthouse, composer Ashley Fure (seventh from left) received a Lincoln Center Award for Emerging Artists, which recognizes extraordinary talent around the campus. Her award has the added designation as the Hunt Family Award, endowed by Lincoln Center Trustee David Hunt. Ms. Fure was nominated by both the New York Philharmonic and Lincoln Center for the Performing Arts. The World Premiere of her Filament, commissioned by the Philharmonic, opened our 2018–19 season, becoming the first piece conducted by Jaap van Zweden as Music Director. Past Philharmonic-nominated winners include Philharmonic Kravis Emerging Composer Anna Thorvaldsdottir (2018), Concertmaster Frank Huang (2017), and composer Julia Adolphe (2016). 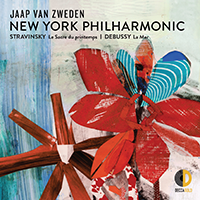 The New York Philharmonic’s third release on Decca Gold, featuring Stravinsky’s Le Sacre du printemps (“incisive, blazingly powerful” — The New York Times) and Debussy’s La Mer (“bold, almost cinematic” — The New York Times) conducted by Jaap van Zweden, is out! Buy from our online store, or buy and stream it from online services.